Father’s Day is fast approaching June 16, 2012. What do you get a father that sacrificed his life for you. My father, Alfredo Herrera cannot read this message, because he still can’t read at 73 years of age. He was a farm worker and marched to Sacramento, he was one of the early boycotters sent to Denver in 1968. Books will not be written about him, nor statues made. In the end he will be just another face among many. 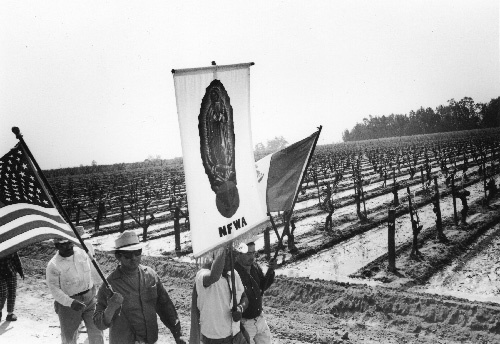 I had the honor of taking my parents to the 50th Anniversary for the UFW in Bakersfield May 18 - 21, 2012; with the help from my sisters Isabel and Maria Del Rosario. The three of us provided the resources for our parents to attend. We are proud to say the union did not pay for their trip and proud that we had the resources to fund their trip. While at the convention, we were having breakfast at the tables designated for the staff and delegates in the back of the convention center. The tables were empty, so we sat down to eat our breakfast and sip our coffee. I was asked to move to the gallery by a young woman that was following orders to move people behind the blue baracade. I was not the only person asked to move other old time organizers were asked to move to the back of the half filled convention center. My father got up and told the young woman, my daughter too was an organizer and grew up with the movement; if she moves, we all move. Fred Ross, Sr. taught him well, we all got up and moved to the back of the auditorium. I am so proud of my Father for his convictions and solidarity for family to this day. My heart swells with love for my Father as we approach Father’s Day in 2012. Dad, gracias for all you sacrificed for your children, grandchildren and great grandchildren. I will always tell your stories. Que viva la huelga!